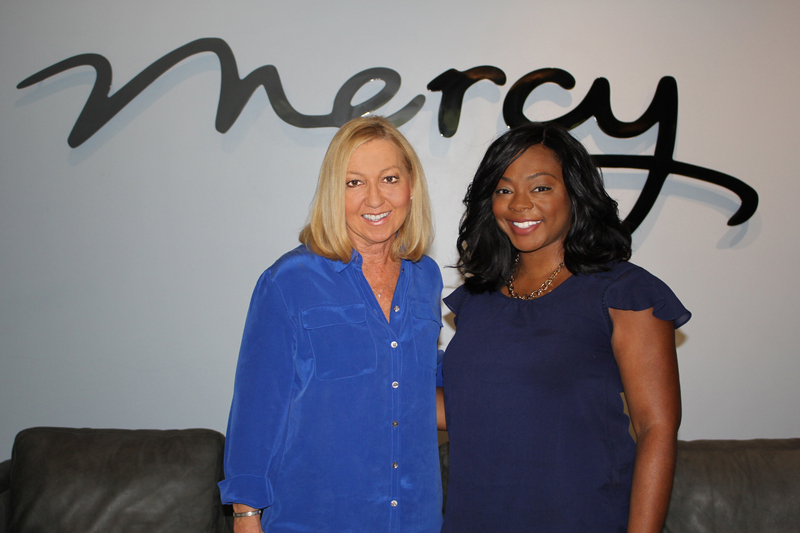 Mercy’s Founder and President, Nancy Alcorn, with Mercy’s new Sacramento Program Director, Fredrica Singletary. Mercy Multiplied is happy to announce that Fredrica Singletary has been named the new Program Director of the Sacramento Mercy home, a home generously donated by the late Buzz Oates in 2009. “We’re excited to have Fredrica step into this new role. Her background and experience will further enhance and develop our ability to serve girls in the West Coast region,” said Christy Singleton, Mercy’s Executive Director. Fredrica has served at Mercy for over five years, beginning as a Residential Assistant in the Nashville Mercy home in 2011. She was promoted to Nashville Residential Supervisor soon after, and then advanced to the Nashville Director of Home Operations position in November 2012. Since then, Fredrica has transitioned to roles within Program Operations working directly with Margaret Troquille, Executive Director of Program Operations, to develop and implement program policies, procedures, and training materials to promote consistency and program excellence across Mercy’s U.S. homes. In 2008, I graduated from Tennessee State University with my B.S. in Psychology. After working for organizations in both the corporate and nonprofit sectors, I received my M.B.A. in Leadership and Nonprofit Management and Certificate in Counseling Psychology from Lipscomb University in 2011. I am currently pursuing my Doctorate of Education in Organizational Change and Leadership from the University of Southern California. What is the best part about working at Mercy? I LOVE that I get to be a part of helping to change the trajectory of our residents’ lives by sharing God’s unconditional love for them. I get to witness their lives totally transform when they recognize their identity in Christ and apply the practical skills that they learn from the program. What are some of your goals in your new role? How will this directly affect the Mercy residents? My goal is to create an environment within the Sacramento Home where staff members feel fully supported and every resident feels safe and empowered to receive healing. What would you like the Sacramento region to know about Mercy’s program/offerings? I would like the Sacramento region to know that in addition to our residential homes, Mercy has outreach activities designed to educate leaders, equip individuals, and empower churches. Mercy’s goal is for both our residents and people outside of our homes to live transformed lives, so we have resources and events available to those who do not enter our residential program. Check out www.MercyMultiplied.com/Resources and www.MercyMultiplied.com/OngoingEvents. From a program perspective, how is Mercy set apart from other treatment programs? The power of choice sets Mercy apart from other treatment programs. As a voluntary program, young women make the decision to enter Mercy’s doors and complete the program. Once they enter the program, young women are equipped with practical tools to help them end destructive behavioral patterns. As they complete the program, they also work with staff members to formulate a plan to apply what they learned in their daily lives after they leave Mercy. What would you say to young women considering application to Mercy? Apply! Visit www.MercyMultiplied.com/Apply. Know that you are precious, you are honored, and you are loved (Isaiah 43:4). Our homes were designed for you! No matter what issues you may be facing, if you are ready for change, Mercy is here to help you transform your life. If you have questions, give us a call at 615-831-6987 or check out the Our Homes section of our website.